The monumental free standing cross was a phenomenon unique to the British Isles and Ireland, and this is one of the finest surviving examples. Carved with great skill, the decoration unites interlace patterns of the British Isles with imagery derived from mainland Europe, such as the pecking bird and the figures of the apostles. Fragment from the shaft of a cross, known as the Easby Cross, sandstone. Rectangular, tapering slightly towards the top, the stone shows on one face the nimbed figure of Christ in Majesty. On either side at the top appear the heads of two angels. The whole surrounded by a raised border. Below the figure of Christ is the top part of a semicircular arch and the halo of a figure now missing. The second broad face shows scrollwork within which are a bird with half-opened wings and below a horse-like beast moving to the left. On either side a ropework border. The narrow sides show alternate panels of vine scrolls and interlaced ornament. This fragment of the cross was noted in 1869 as being kept in the grounds of Easby House, in a private collection. According to local tradition it was discovered by the owner, R.M. Jaques, in a field wall. This fragment was purchased by the museum in August 1930 from L. Jaques of Easby House. Later that year, the three other surviving pieces of the cross were bought for the museum by the National Art-Collections Fund and extracted from the fabric of Easby Church into which they had been built. The cross from which this fragment comes was broken and mended at some time between its creation in about 800 and the use of at least three of the fragments as building blocks for Easby church, probably in the thirteenth century. Molten lead was used to mend the cross, a process recorded by Symmeon of Durham in a similar operation on a cross from Lindisfarne. 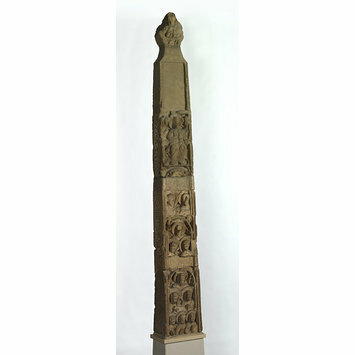 Lang, J. Corpus of Anglo-Saxon stone sculpture.North Yorkshire Oxford University Press, 2001. pp. 98-102. Williamson, P. European sculpture at the Victoria and albert Museum London: Victoria and Albert Museum, 1996. p. 31. Brönsted, Johannes Early English Ornament. London: Copenhagen: Hachette Ltd. ; Levin & Munksgaard, 1924. Lang, J. The Richmond Review. Richmond : Castle Print, 1994. pp. 14 -17. Longhurst, M. The Easby Cross. Archaeologia Vol. 81 1931. pp 43-47. Kitzinger, E. Anglo-Saxon Vine-scroll Ornament. Antiquity. 10, 1936. Kendrick, T. D. Anglo-Saxon Art to A. D. 900. London: Methuen & Co., ltd, 1938. Clapham, A. W. English romanesque architecture before the conquest. Oxford: Clarendon Press, 1930. Early Mediaeval Art in the North. London, 1949. pls. 12-13. Salvini, R. Medieval Sculpture. London, 1969. pl. 37. p. 315. Stone, L. Sculpture in Britain: the Middle Ages. Harmondsworth, 1955. p. 20. pl. 13. The making of England: Anglo-Saxon art and culture A. D. 600-900. London, 1991. pp. 149-50.